Psych-Pop, Folk Pop, Harmony Pop and just plain Pop! What's wrong with pop? Most aficionados of sixties music shun the genre, but it is an essential link between the rougher early music and the next decade. You will notice that most of these songs are from 1967 onwards. As much as the Byrds' jangly sound triggered an (r)evolution, the Beach Boys' new sound direction paved the way for many of the bands featured here. "Brian Wilson's IS a genius" slowly entered many aspiring songwriter's mind. How right they were! Emphasis is now on orchestration, arrangement and production of the songs. This is no longer Garage music but studio music what with orchestras and exotic instruments no longer playable by young teenager musicians. The vocals are often layered, the production techniques refined, the lyrics more complex. This is "Baby I love you" with a introspective tweak. Notice how the song's title also become longer and longer? The "Concept Album" is not far away. As a matter of fact, most of these bands produced a full LP, not just a flash-in-the-pan 45. The essence of Pop music also lies in the urge of bands to reach the top of the charts, usually with the help a good producer. They wanted to be taken seriously and that alone explains the care devoted to the music. While most of the albums sunk without trace, the bands certainly tried hard because they were aware that this was their one only chance at success. If the Beach Boys did it while mutating from the campfire "Barbara Ann" to "Pet Sounds", why couldn't a unknown band or artist have success doing it their own way? While most of them never reached such heights, there are some real diamonds in the rough here. 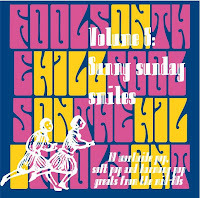 This compilation covers the whole range of this style: from quasi-easy listening to little pop-psych masterpieces, there's even some near bubblegum in here. My personal fave goes to Smoke's "Cowboys and Indians", from their Kim Fowley produced LP. This will be the subject of a future post, as we recorded/remastered many of the albums these songs were lifted from. They used to be fairly hard to find (usually in the 1$ bin), but this has changed a lot in the last 5 years thanks to renewed interest from collectors. Get your sunny Sunday smile here! Splendide ! merci beaucoup pour ce très beau travail de compilation, ça s'avale cul-sec !! Great stuff! Thanks for the music! Many thanks for this lovely comp. It's actually managed to bring the sunshine to this otherwise cold and rainy corner of North Berks! Many thanks for this lovely comp. It's brought a little bit of sunshine to this otherwise cold and rainy corner of North Berks! Thank you so much for taking the time to make and share these mixes! Absolutely fantastic comp filled with sunshiny kaleidoscope eyes. Now I gota find copies of Mark Eric and The Sundowners and so many others. Thanks for enabling my never ending obsession with wonderfully obscure !!! Enormous thanks for this stunning comp with sunshiny kaleidoscope eyes. Now I gotta get hold of more Sundowners, Mark Eric among others. Thanks for aiding and abetting my obsession with the delightfully obscure. Thanks and additions to the posts. Demon Fuzz - Afreaka !